The Em Rex Cover is to be used with the Em Rex® Unit to deter unintended / malicious activation of the unit when it is installed in a public area. The device is passive and has no electronics that could fail and cause the device not to operate. The device has two sets of outputs, which are used to monitor the operation of the cover being lifted. 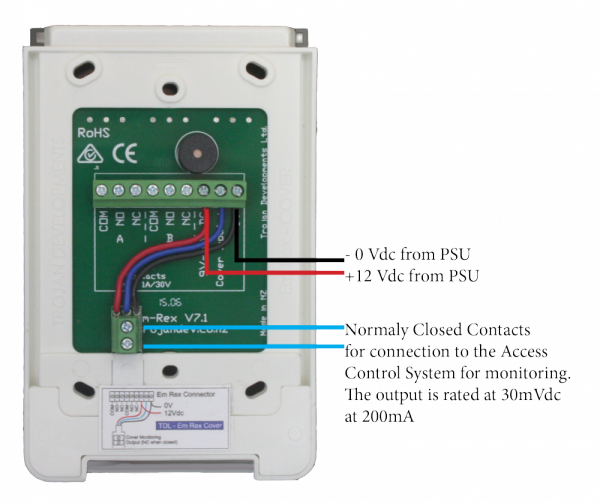 One set of contacts connects to the piezo (buzzer) on the Em Rex® Unit and the second to the Access Control System for monitoring. The cover is designed to clip into place when closed so as to make the operation of it a deliberate action as it will not lift without reasonable force. This will prevent any accidental operation of it. Please note: the contacts stated above, are when the cover is in the closed position. Please note that the cover is held closed by two little nodes on either side of the cover at the bottom and makes to cover quite hard to open. If the opening needs to be made easier, it is a simple case of filing down the nodes on the side of the cover until the desired resistance is achieved. But be carefull not to over do it.